We learn from a very young age that that every choice we make, whether good or bad, comes with a consequence, good or bad depending on the choice, attached. I love the demonstration of putting the word choice and the word consequence on a stick showing that you can’t pick up the choice without picking up the consequence. We have agency to make our own choices, but we do not get to choose the natural and binding consequences that come with those choices. It’s great news! We can avoid a lot of negative consequences by not making bad choices. However, for some reason this often leaves us surprised, even to the point where we may doubt our faith, when difficult things happen in our lives even though we constantly make good choices. I’ve blogged before about this seemingly paradoxical doctrine. It can feel very perplexing. If difficult things are going to happen to us whether we are righteous or not, why should we bother being righteous? When you know you have a test coming up in school, you had (or have, depending on your situation) two choices. You can study for it, or not. Studying for the test does not change the difficulty of the test, but it does expand your ability to take the test. We are going to be tried whether we are righteous or not, but being righteous expands our ability to succeed in trials. Yet I will own them, and they shall be mine in that day when I shall come to make up my jewels. Therefore, they must needs be chastened and tried, even as Abraham, who was commanded to offer up his only son. For all those who will not endure chastening, but deny me, cannot be sanctified. One of the many reasons Heavenly Father is testing us is to see if we trust in and rely on the atonement of Jesus Christ or if in those times of trouble we will deny Him. When I was a cheerleader in High School (I know, sounds random, but I’ll bring it back around) one of the first things we did was trust falls. On the off chance you don’t know what a trust fall is it is a group or partner trust building game in which a person deliberately allows themselves to fall, usually backwards, relying on the other members of the group (spotters) to catch the person. We are being asked to trust in the Lord Jesus Christ. Heavenly Father allows a trial or affliction to happen to us, and then says “Don’t worry, my Son can catch you.” We may feel like we are standing on impossibly high bleachers and being asked to fall into the arms of someone we can’t see. We need to learn to trust that we will be caught. The first step in trusting that we can be caught is to gain a knowledge and testimony of the identity and divinity of Jesus Christ. The next step is recognizing his ability to catch us, which requires a testimony and understanding of the completeness of the atonement. Neither of these topics are the point of today’s blog post, so although it’s compelling to dive deeper (I’m a sucker for tangents) I’ll leave that alone for today. Though here is a past post I did that touches on the completeness of Christ’s redeeming sacrifice for us. When we have an understanding of who Christ is and what he is capable of the next step is to gain an understanding of how to apply it in our lives. 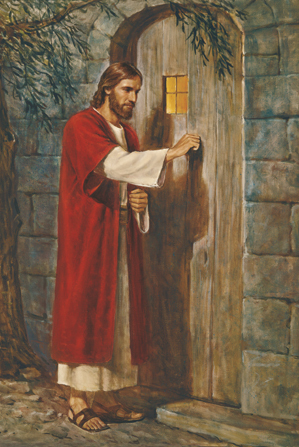 Have you ever wondered why he stands at the door and knocks? Why doesn’t he just come in? Agency. If he applied the atonement without us choosing it, it would void our agency! We must choose to apply the atonement in our lives through our actions, our obedience to the commandments he has given us (general and through personal revelation) and willingness to repent. He has already suffered for us, He wants to catch us, He is infinitely able to catch us, all we have to do is tell Him we want to be caught. If you choose not to apply the atonement in your life there will be no one to catch you when you fall! Imagine how he feels, filled with the capacity and willingness to catch us, but constrained from helping us because we did not ask him to and therefore he must stand helplessly by and watch us hit the bottom. Great news: Until you hit the ground there is still time to ask to be caught! Even if you are mid fall, even if you only just came to a realization you were falling, even if Satan pushed you off, you can still choose to be caught. Choose to let the Savior catch you. Be as obedient as you can to the knowledge and testimony you currently have. Actively seek for and be willing to receive and act on increased knowledge and testimony. Difficult situations will still arise, bad things will still happen to good people, but as we increasingly trust in the Lord’s ability to redeem us eternally we will view our trials not as a burden, but as a blessed opportunity to have our Savior catch us in his loving arms.